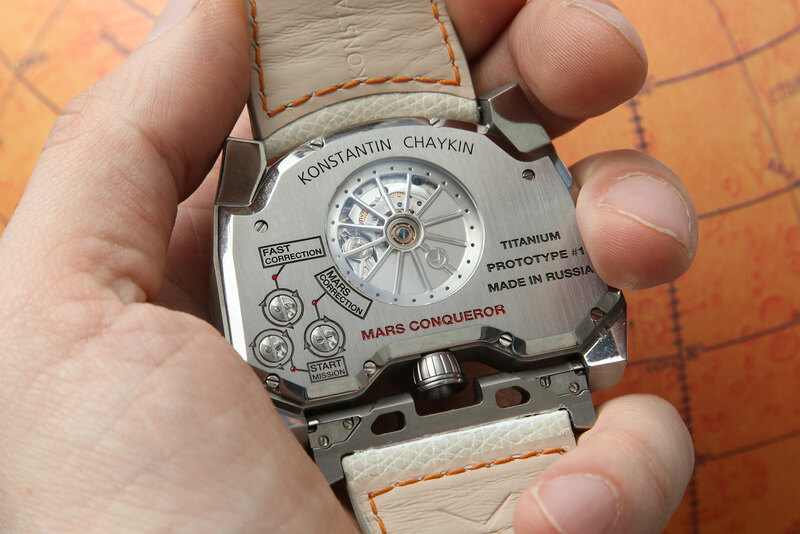 Having already revealed the movement last year, Russian watchmaker Konstantin Chaykin has finally taken the covers off the prototype of the Mars Conqueror wristwatch on International Day of Human Space Flight, the annual commemoration of Yuri Gagarin’s pioneering space flight on Vostok 1 in 1961. 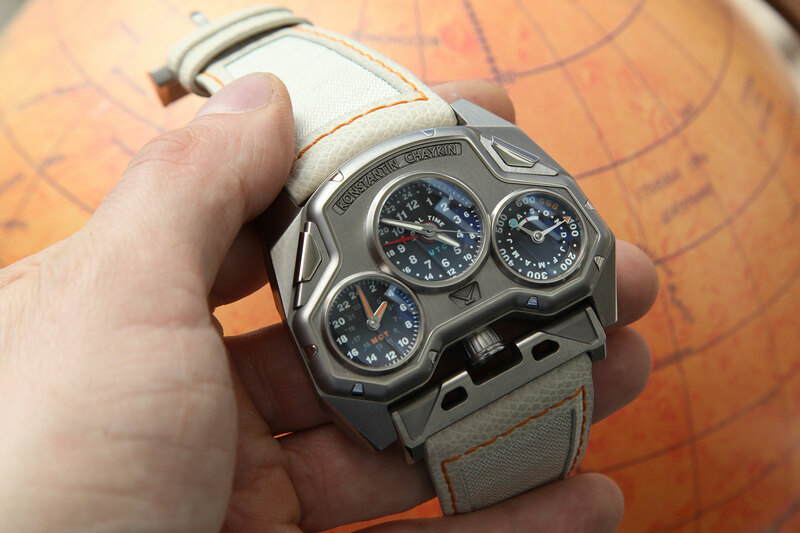 While most sci-fi inspired watches are usually conventional time-telling devices underneath the spaceship cases, the Mars Conqueror is actually an extraterrestrial timekeeper. 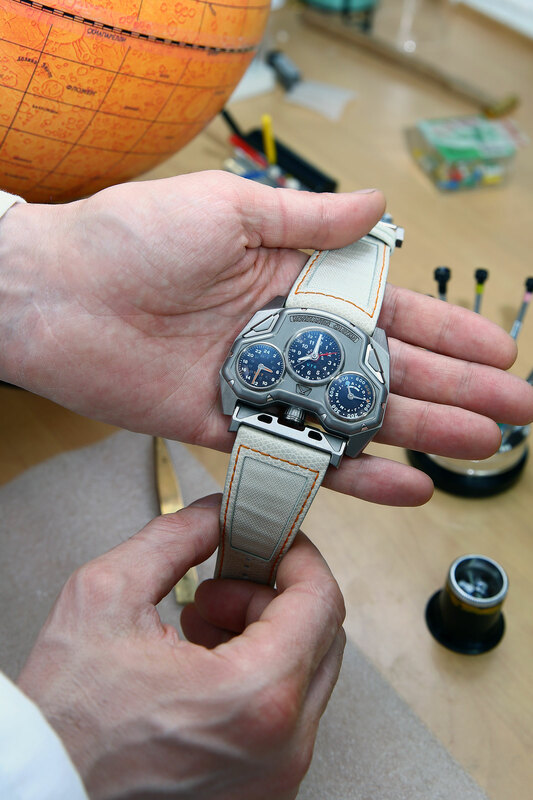 The watch displays local time as well as UTC, equivalent to Greenwich Mean Time (GMT), and also average solar time on Mars, along with several other astronomical indications. Time on Earth, both local and UTC, are shown in the centre sub-dial, while Martian time is on the left sub-dial, shown in sols, or Martian solar days. A Martian solar day is about 39 minutes 35 seconds longer than an Earth day, and a Martian year is made up of 668 sols. The rightmost sub-dial shows the Martian date, expressed approximately with a monthly scale, as well as the relative distance between the Earth and Mars that varies throughout the year. Earth time is set via the crown, which also winds the movement. The Mars indicators are set via screws on the case back. 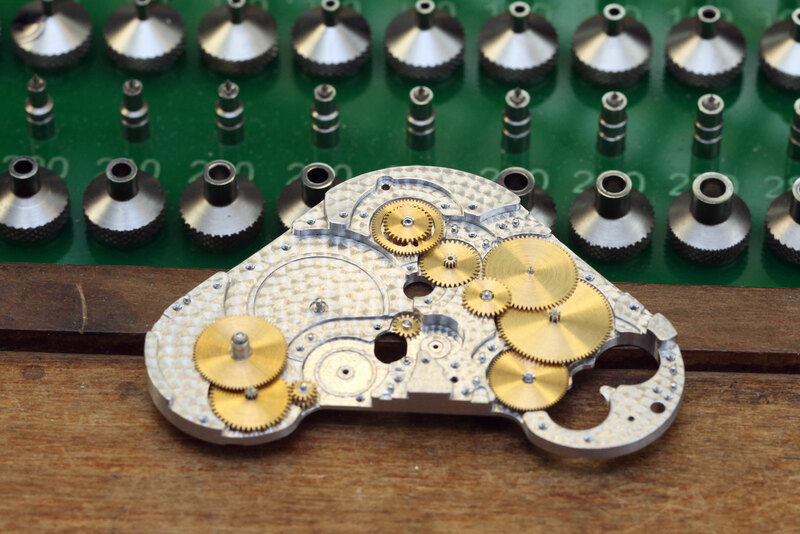 It’s powered by an unusual, triangular movement, the cal. K20-1, which is actually comprised of a large and complex Martian time module on top of an ETA 2836-2 base movement. The module alone is made up of 175 parts, including 30 wheels. The cal. 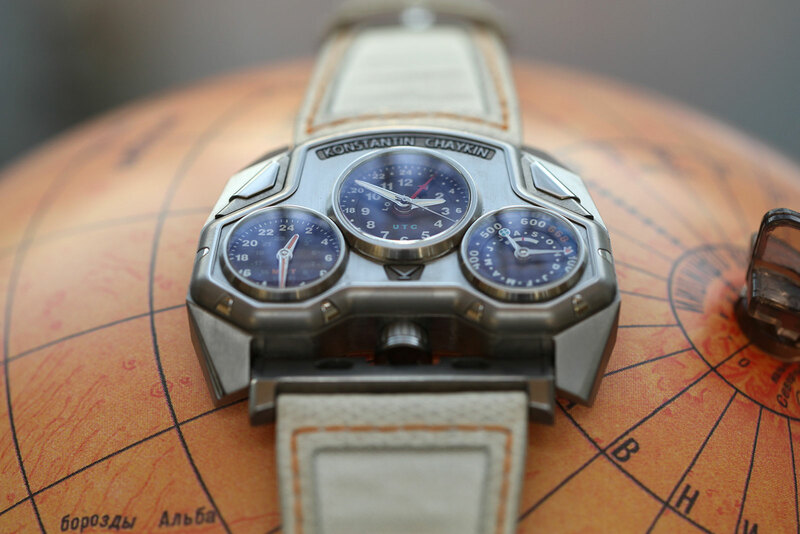 K20-1 sits inside a titanium case that echos the shape of the movement and is inspired by instrument panels inside Soviet spacecraft of the 1960s. It measures a 51.2mm wide and 32.6mm long, and is 8mm high. A small porthole on the back reveals the ETA base movement. 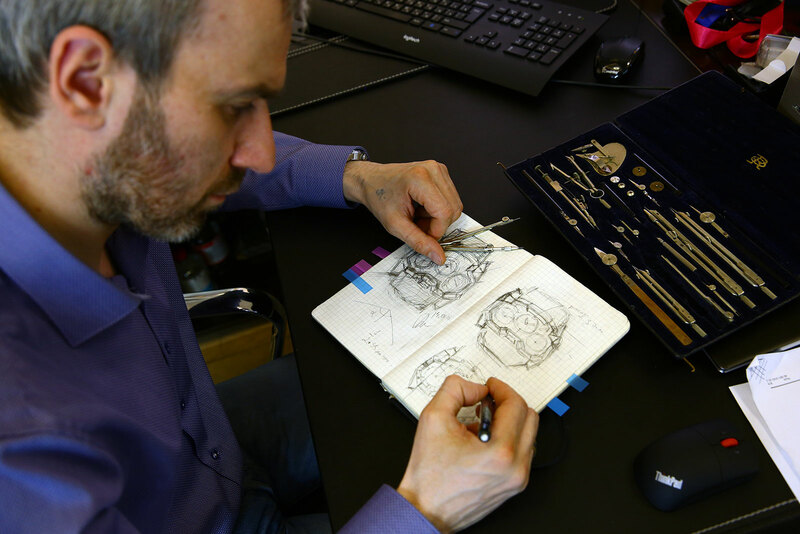 The watch pictured is the “Mk I” prototype, which will be improved before the watch enters production. Amongst the tweaks Mr Chaykin will make is eliminating play between the wheels that drive the Martian time display, as well as redesigning its rocking bridge so Martian time can be set independently without affecting the UTC time display. Exotic as it is, the Mars Conqueror is not a first. 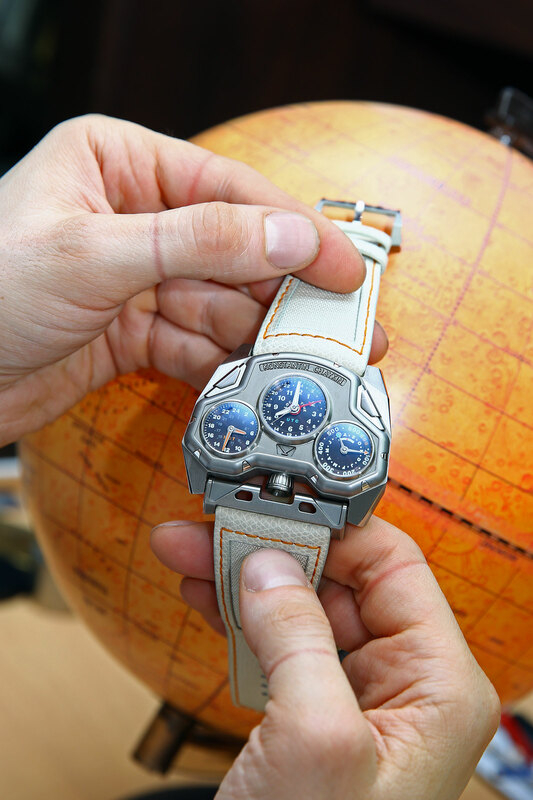 An American watchmaker created a series of low-cost watches showing Martian time in 2004, to commemorate NASA’s Mars exploration mission that year. The Mars Conqueror “Mk II” will be launched in the fall of 2019 as a limited edition. Stay tuned for more details.